As per the directions issued to this office by Dy. Controller of Accounts (Tech. ), O/o Principal Accounts ice vide letter dated No.F.4/Adv/Pr.AO/35/T-/10.11/565-591 dated 23.03.2019 (copy enclosed) citing ent, Govt. of NCT of reference to Notification dated 31.01.2019 endorsed by Ministry of Flnance Departm hich is regarding enhancement of monthly oement contributions under New Pension Scheme f Basic Pay DA w.e.f. 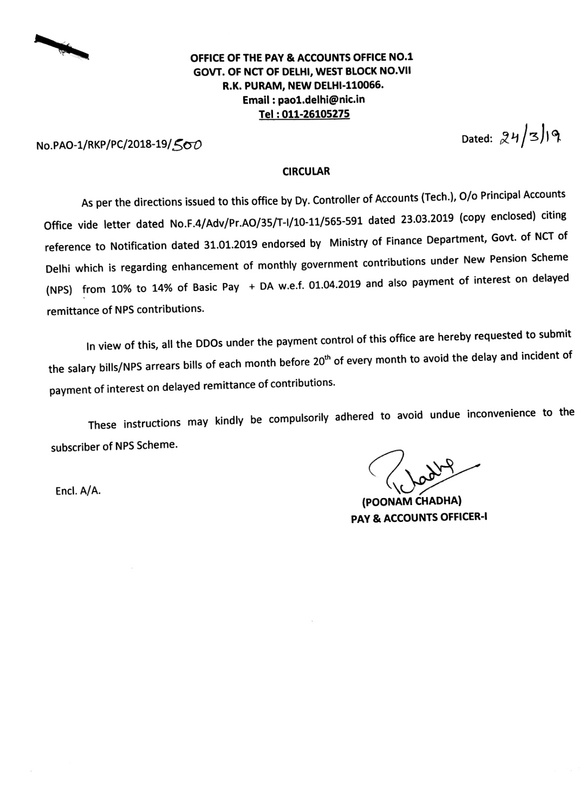 01.04.2019 and also payment of interest on delayed + DA w.e.f ( NPS ) from 10 % to 14 % remittance of NPS contributions In view of this, all the DDOs under the payment control of this office are hereby requested to submit the salary bills/NPS arrears bils of each month before 20h of every month to avoid the delay and incident of payment of interest on delayed remittance of contributions, to the These instructions may kindly be compulsorily adhered to avold undue inconvenience subscriber of NPS Scheme Encl. Rega government contribution under New Scheme and payment interest Sir/Madam, endorsed by the Finanoe Depertment, Govt. 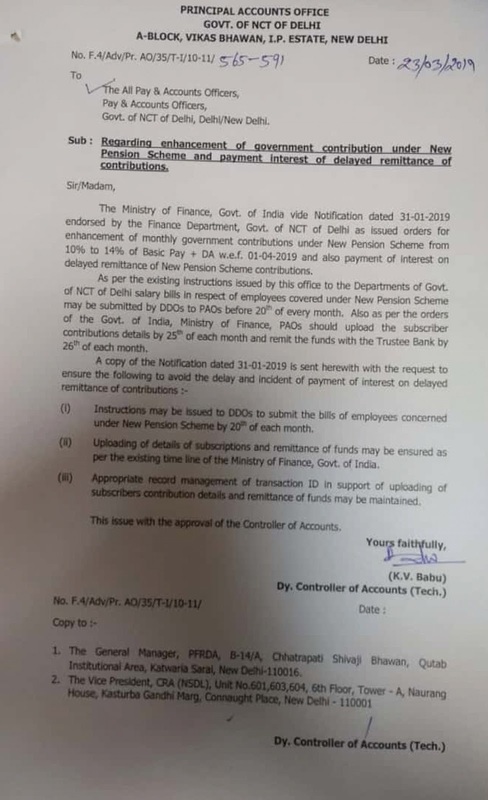 of NCT of Delhi as Issued orders for enhancement of monthly government contributions 10 % to 14 % of Basic Pay + DA wel , 01-04-2019 and also payment of interest on delayed remittance of New Pension Scheme contributions. The Ministry of Finance, Govt. of India vide Notification dated 31-01-2019 under New Pension Scheme from As per the existing instructions issued by this office to the Departments of Govt of NCT of Delhi salary bills in respect of employees covered under New Pension Scheme may be submitted by DDOs to PAOs before 20" of every month. Also as per the orders of the Govt. of India, Ministry of Finance, PAOs should uploed the subscriber contributions detals by 25" of each month and remit the funds with the Trustee Bank by 26h of eech month. A copy of the Notiflication dated 31-01-2019 is sent herewith with the request to ensure the following to avoid the delay and incident of payment of interest on delayed remittance of cantributions- (0 Instructions may be issued to D0Os to submit the bills of employees concerned (0) Uploading of details of subscriptions and remittance of funds may be ensured as (H Appropriate record management of transaction ID in support of uplcoding of under New Pension Scheme by 20 of each month. per the existing time line of the Ministry of Finance, Govt. of India. subscribers contribution details and remittance of funds may be maintained. This issue with the approval of the Controller of Accounts.